The Roman poet and epic publisher Vergilius Maro, also Virgil or Virgilius (70-19 BC) is considered the most important author of the classical Roman antiquity and is a classic of Latin school reading. His most famous works Bucolica (Eclogae), Georgica and the unfinished Aeneis revolutionized Latin poetry. Vergil turned to a comprehensive education in all those fields of poetry and lived mostly secluded in Naples or on Sicily, He was like that Horace (65-8 BC) a favorite of Emperor Augustus (63 BC to 14 AD). In the multi-volume agricultural doctrine "Georgica" the laborious, rural work and agriculture with impressive, brilliant language art is described. Again and again Vergil praises the blessing, the idyll and the harmony in nature. He creates the connection of high poetry with the help of specialized knowledge. Next Cicero and Horace He is one of the most important representatives of the "golden" Latinity, the name for the literary era of the period of about 60 BC. To 40 AD, in which Roman poetry and prose reached their highest content in terms of content, language and form. In the second of the four books is mainly the viniculture treated. In it he reports on the grafting and the appropriate location of vines, the cultivation of vineyards, the care of the plants, the cultivation of the floors, the properties of selected varieties, as well as the pressing and the winemaking, He describes around 15 antique grape varieties and mentions the then famous wines Caecubum. Falernum and Raeticum, Visibly, he had a penchant for Sweet wines because he recommends " leaving the grapes on the vine until November until stiff frost be " . He also remarked: "Be the first to dig the ground, but the last to harvest the grapes" . The Roman author Columella (1st cent.) Praises his work. Parts of it are also in the famous agricultural collection Geoponika from the 10th century included. 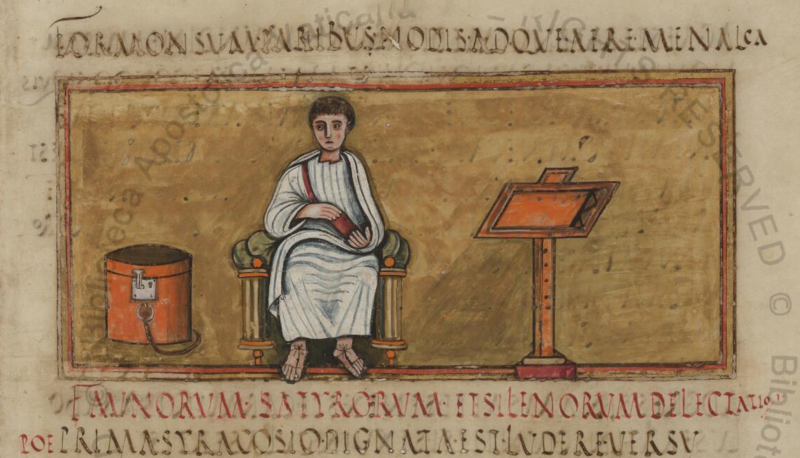 The picture shows a page of "Vergilius Romanus". This is the name of an illuminated manuscript of the 5th century with texts of Virgil, which is kept as Codex Vaticanus latinus 3867 in the Biblioteca Apostolica Vaticana. This page was last modified at 12 October 2018 at 17:59.